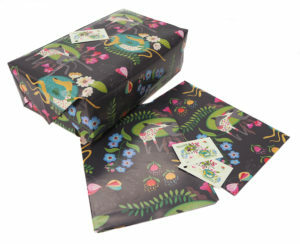 Designed by Rollerdog exclusively for Forever Hounds Trust, this beautiful and colourful gift wrapping paper features a greyhound and lurcher happily rolling around in spring flowers without a care in the world! The perfect way to present a gift for someone who loves greyhounds, lurchers, whippets or any sighthound. See our range of ‘Rolling Hounds’ gifts in this beautiful design, including mugs, tea towels, apron, notepads, greetings cards.